Size of Male: 13-15 lbs., 12-14 in. Size of Female: 13-15 lbs., 12-14 in. The Miniature Schnauzer is an intelligent and friendly dog. These low maintenance dogs thrive best indoors and get along well with children and other pets. They are also easy to train, making them excellent pets for even unskilled owners. This terrier breed needs daily exercise, they are tolerant of any climate, and they can adjust easily to new conditions and climate changes. The Miniature Schnauzer was first exhibited as a breed in 1899. AKC recognition began in 1933. The dog arrived in America long after larger Schnauzers, but in the era following World War II the breed soared in popularity, at one time holding the position as the third most popular dog breed. This small dog breed is a playful and intelligent dog that is less aggressive than other terriers. They are easily trained and serve well in capacities ranging from household pets to tracking dogs and hunting dogs. When properly socialized, these dogs get along well with children as well as other dogs. Living Environment – This breed can thrive in almost any living environment. Because of the frequency of their barking, however, a house is a more suitable environment than an apartment. They do best in a family environment and they love to be in the middle of any activity. Additionally, they do not do well with life in a kennel due to their high energy and activity level. Grooming – This little Schnauzer needs to be regularly brushed in order to limit tangled and matted hair. Regular brushing can eliminate the need for clipping, though many Schnauzers are clipped twice yearly. Professional plucking is required. The breed has fairly tangle-resistant hair, and sheds little, making it well suited for people with allergies. Diet & Exercise – Their diet should be portioned to prevent overeating. These dogs have minimal exercise requirements. Because they are by nature energetic, they get a great deal of indoor exercise. Further exercise requirements would include a moderate daily walk on a leash or outdoor play in a yard or dog park. Health – These little dogs generally live longer than larger breeds, but are prone to dog health problems. The most common ailments for these dogs include urolithiasis and progressive retinal atrophy, though minor concerns include follicular dermatitis and esophageal achalasia. 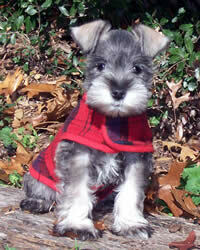 The Miniature Schnauzer is obedient and well mannered, making it an easy breed for training. The dogs should be supervised and can be quite demanding. Obedience training started at an early age can help the owner to overcome the tendency of this breed to exhibit stubbornness. They are fairly easy to housebreak and show an eagerness to learn.